Without further ado, here is a 2017 guide list for the mattress stores where you can buy a pretty good mattress that suits you. There are many types of mattresses in US stores today, and each one can feel very different. Choosing a good mattress means figuring out what you personally find most comfortable. Mattress Firm is quite spread in USA, MF has shops in 37 states. They have a few catchy offers such as a 90 days payment, guaranteed on time delivery. Mattress Firm presents such brands as Tempur-Pedic, Sealy, Serta, Hampton & Rhodes and others. The cheapest mattresses in the on-line store are about 300 $, some of them are on the clearance sale, which is going on now. And the lower price, for example, of Tempur-Pedic’s mattress is 1.200 $. On site you have an opportunity to shop by comfort and type of mattress. You can also purchase pillows, mattress protectors and frames. Unfortunately, an option to choose mattress and accessories by size or by firmness is not allowed. You can use store locator on official site stores.mattressfirm.com to find store near you. Bedding Experts has almost 80 stores in Illinois, Florida, Indiana. BE offers College Delivery, 0% APR for 5 years and low price guarantee for 60 days. Bedding Experts sells such brands as Tempur-Pedic, Sealy, Simmons Beautyrest, Hampton & Rhodes and others. The cheapest mattress costs about 180 $.The lowest price of Tempur-Pedic’s mattrasses is 1.100 $. An on-line store has a mattress finder by design, price, comfort, size and brand. Plus you also can buy different type of accessorizes: pillows, bed bases, headboards, steel bed frames, mattress protectors and etc. A glossary of mattress terms, a care instruction and a mattress size chart are presented on the site. Use store locator on www.beddingexperts.com/locations to find store in your area. Over 50 Mattress Warehouse stores are situated throughout West Virginia, Kentucky and Ohio. Mattress Warehouse sells mattresses by as Tempur-Pedic, Sealy, Octaspring, Stearns & Foster and others. This company offers such benefits as 0% APR for 5 years and free HDTV, free same day delivery. Mattress Warehouse also offers a mattress recycling. You had better visit their site for current offers, which are very catchy by the way. 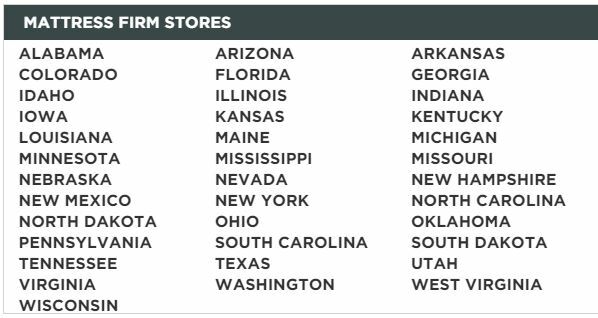 Sleep Country has 77 stores in Oregon and Washington. Sleep Country offers free delivery and 100 day money back guarantee. Sleep Country sells such brands as Tempur-Pedic, Sealy, Beautyrest, Serta, Stearns & Foster and others. On-line store has a very vary searching parameters by price, size, comfort level, brand, mattress type and such an important parameter as sleep position. The cheapest mattress will cost you approx 150 $. The lowest price of Tempur-Pedic’s mattresses is 1.350 $. In Sleep Country stores you can buy different bases and beds, pillows, protection and essentials. On their website placed a short quiz “Mattress finder” that can help you to find the right mattress shortly. Also you can find the foundation height and mattress size chart, and much more other information. America’s Mattress has nearly 400 stores across the USA. In stores presented such brands as America’s Mattress, Serta and others. The on-line store first of all asks you to choose the type of mattress or brand; it’s not very comfortable, if you would like to compare between different types or brands. Pricing and availability varies by location. The cheapest mattress costs about 200 $, but price can differ, as I’ve already said. Sleepy’s is a leading mattress retailer in the USA, it has almost 700 shops in the Northeast and Mid-Atlantic regions. Sleepy’s retails such brands as Tempur-Pedic, Sealy, Simmons, King Koil, Serta, Stearns & Foster and others. The cheapest mattress costs about 200$. Sleepy’s offers 60 night comfort exchange guarantee, an interest free terms in all stores, free old mattress removal, which are very catchy, don’t you think? At the store and on-line you can also buy all accessorizes and essentials you need. On site presented sleep healthy tips, mattress size chart, and also a questionnaire ‘Find your mattress’, which I find very complete and sufficient. For some reason it’s the second on-line store that requested zipcode so strongly, so I’ll present information for New York. Mattress Factory has about 12 stores in Philadelphia and New Jersey, guarantees free setup and removal, nationwide delivery and no commission staff. It sells such brands as Tempur-Pedic, Sealy, Beautyrest, Serta, Stearns & Foster and others. The cheapest mattress costs 150$ (this item is on sale, regular price is 300$). Tempur-Pedic’s mattresses prices starts from 2.400 $. Searching parameters at on-line store is quite ordinary by price, mattress size, comfort level, type and brand. Mattress protectors, pillows and beds frames can be purchased in shops as well as on the site. Web-site has reviews page for consumers all of reviews are positive and 5 stars rate. Sleep Train has over 110 stores in California. Sleep Train guaranties free delivery and 100 day money back guarantee. In shops and on-line store presented such brands as Tempur-Pedic, Sealy, Beautyrest, Serta, Stearns & Foster and others. Searching process in on-line store is user-friendly, you can choose price, size, comfort level, brand, your sleeping position and type of mattress you want to buy. The cheapest mattress will cost you about 150 $. The lowest price of mattresses by Tempur-Pedic is 1.600 $. In Sleep Train stores and on-line you are able to buy many different bases, pillows, protection, essentials and etc. Sleep Train website has a 4 steps quiz “Mattress finder” that will find the right mattress in a minute. Also some information about mattresses is published on a website like the foundation height and mattress size chart.